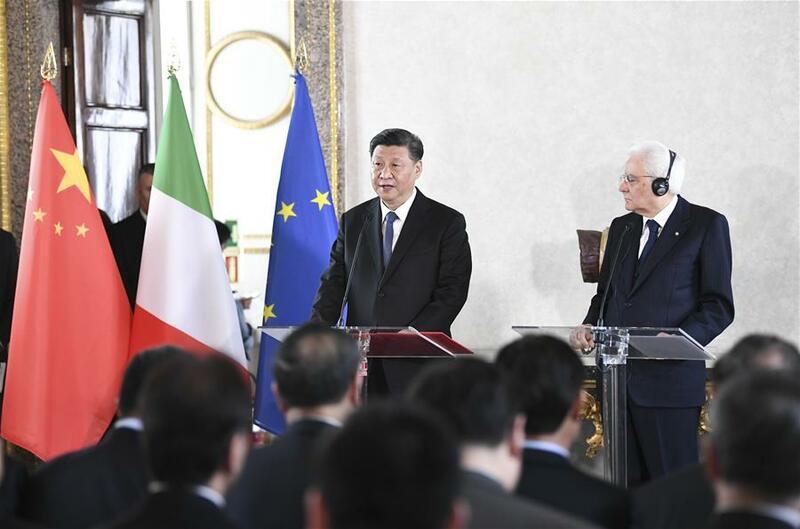 Chinese President Xi Jinping on Friday urged personages of business and cultural circles in China and Italy to contribute more wisdom and strength to the cooperation between the two countries. Xi made the remarks when speaking to representatives attending the meetings of the China-Italy Entrepreneur Committee, China-Italy Third Party Market Cooperation Forum and China-Italy Cultural Cooperation Mechanism, which are being held in parallel in Rome. While offering congratulations on the simultaneous convening of the three institutional meetings for the first time that showcases the China-Italy practical cooperation, Xi thanked the personages of business and cultural circles from the two countries for their long-time efforts and contributions to promote bilateral economic and trade cooperation, deepen mutual understanding between the two peoples and enhance the friendship between the two countries. Xi said that China and Italy both boast a time-honored history and highly value carrying forward their own civilization, which lay the foundation for the two countries to enjoy mutual understanding and lasting friendship. He praised the China-Italy relations as being strategic partners featuring mutual respect and trust, cooperative partners featuring mutual benefit and win-win result, and cultural exchange partners featuring mutual learning. China and Italy enjoy a solid political foundation for bilateral exchanges and cooperation, as the two sides can accommodate each other's core interests and major concerns, Xi said. The two-way trade has developed steadily and the bilateral investment has grown rapidly, bringing tangible benefits to the two peoples, he said. On cultural front, the two countries have witnessed splendid exchanges, taking the lead in cultural exchanges and cooperation between China and the West, he said. "I am full of confidence in the prospect of the development of China-Italy relations," the Chinese president said. Xi noted that as next year marks the 50th anniversary of China-Italy diplomatic ties, the two sides will hold year of culture and tourism in each other's country, and they will embrace new opportunities in cooperation in various areas. China stands ready to work with all walks of life in Italy to push for a steady and long-term development of the bilateral relations on the path of mutual benefit and win-win result, and to make new contributions to boost the China-Europe connectivity and global development and prosperity at large, Xi said. "I hope that personages of business and cultural circles in China and Italy contribute more wisdom and strength in your own fields to the cooperation between our two countries," he told the representatives. Italian President Sergio Mattarella, who also spoke at the meeting with the representatives, agreed that both Italy and China are countries with an ancient civilization, which is the root of their profound relations. The two countries enjoy a traditional friendship and a long history of trade and cultural exchanges, he said, noting that under the new circumstances, the Italian government supports the business community of the two countries in deepening economic, trade and investment cooperation, and supports cultural circles in carrying out all-ranging exchanges. The two sides should work together to elevate their economic and trade cooperation to a new level, and expand cooperation on cultural Silk Road, in a bid to bring greater benefits to the two peoples, jointly respond to the challenges facing the world today, and lift the bilateral ties to a new height, he added. Xi arrived in Rome Thursday for a state visit to Italy, the first stop of Xi's three-nation Europe tour, which will also take him to Monaco and France.